Henry Edward Taylor was born in 1856 at Leominster, the son of an inn keeper. His father died when Harry was still a youngster, and by the time he was aged 14, Harry was working as a grocer’s assistant in Leominster. By 1881, he had moved to Gloucester, where he found lodgings in St John’s Lane, employment as a plumber and glazier, and joined the Gloucester Club. Harry made his first appearance for Gloucester in the opening match of the 1881-82 season, scoring a try as Gloucester beat a Colts XXII by three goals to one on 1st October 1881. He quickly secured a regular place in the team, and on 12th November he scored a try at Worcester, which upset the home crowd so much that they invaded the pitch (not for the first time) and prevented the conversion from being attempted. However, Gloucester won the match by one goal and two tries to nil, although Worcester failed to turn up for the return fixture in Gloucester later in the season. Harry was selected for the County trial match on 3rd November 1881 at the Spa, not surprising since the North of the County side was made up entirely of Gloucester players. They beat the South by two tries to one goal, but no cap followed for Harry that season. In the New Year, Harry scored a brace of tries in a comfortable win against Cheltenham, and another away at Newport, which proved to be the decisive moment of the match as Gloucester won by a try to nil, and then did likewise at Newent. By the end of the season had racked up 19 appearances and scored eleven tries, which made him the top try scorer in the Club. In 1882-3, Harry was member of the famous “Invincibles” as Gloucester went through the season unbeaten, with their 14 fixtures resulting in eleven wins and three draws. Harry played in all but one of these fixtures, scoring eight tries. He made an early mark with two tries against Cheltenham contributing to a win by one goal and two tries to two tries, and followed up with another two against Cardiff in the best win of the season by one goal and seven tries to nil. In the final game of the season he scored two more in a big win against the Royal Agricultural College, Cirencester. Harry made his debut for Gloucestershire on 23rd December 1882 in a scoreless draw against Somerset at the Spa. He won further caps against Devon at the Spa on 13th January 1883, which Gloucestershire won by two goals and one try to one try, and against Midland Counties at Coventry on 17th February 1883, when Harry was the match winner with two tries in the victory by one goal and one try to one try. Early in the 1883-84 season, Harry scored two tries in a massive win at Bath by five goals and twelve tries to nil, and another in the return fixture, which Gloucester won by a mere two goals and six tries to nil. He scored a pair of tries in each of the matches against Weston-super-Mare, Bristol Medicals and Cheltenham College, and finished the season with ten tries from 15 appearances. Harry played in the County trial in November 1883, and was selected for the first Gloucestershire match against Kent, which was drawn one goal apiece. He won further caps against Somerset (lost) and Oxford University (drawn). Harry registered tries against Bath and Bristol Medicals in the first half of the 1884-5 season, and played in the Boxing Day fixture against a London team, when he came close to scoring early in the second half but was pushed into touch before “a lot of loose play took place, and Taylor, rushing up, picked the ball up and ran in, gaining a try for the home team, and H Boughton kicked a goal amidst deafening applause” – it was the only score of the match. But the tries then dried up and Harry finished the season with only three from 14 appearances. Harry again played in the County trial, and was selected for an England trial, when he was the only Gloucester representative for the Western Counties against London at Blackheath on 12th November 1884; London won by two goals and one try to nil. Harry won another cap for Gloucestershire against Somerset at the Spa on 10th January 1885 in a game won by one goal and one try to nil. At the end of the season, WB commented in the Citizen that “Taylor shines more as a brilliant defensive player”. Harry was less available in 1885-6, but opened his scoring with yet another try against Bath, and WB summarised his season as: “Taylor has only played in some nine matches, but has been as good as ever at his own forte, a defensive game. He has scored five tries.” This form was recognised in selection for representative rugby. After the early season County trial, Harry was selected for the first Gloucestershire match of the season against Untied Hospitals at the Spa on 29th December 1885, which the home side won by two goals and one try to nil, largely thanks to two tries from Harry. He won further County caps against Somerset and Oxford University, but both games were lost. Meanwhile Harry was selected for his second England trial on 11th November 1885, appearing alongside his Gloucester teammate, R H O Bankes, for Western Counties against London, who won by one goal to nil. After appearing in the County trial, Harry won two caps against Somerset (drawn one try apiece) and Devon at Exeter on 12th March 1887. Harry scored two tries to help Gloucestershire win by two goals and two tries to one goal. Harry played in all but one of the 19 fixtures in 1887-8, and his eleven tries again made him the Club’s top try scorer. He acted as captain on a number of occasions when Tom Graves Smith was absent. A measure of Harry’s form came in the final match of the season against Cardiff – “C E Brown neatly picked up in the loose, and seeing a clear opening, passed to H Taylor, who galloped over the line amidst a scene of wild excitement, hundreds of hats and handkerchiefs being waved for several minutes.” And later “the Cardiff forwards, by a round of brilliant passes, enabled Briggs to look dangerous, but his onward career was cut short by H Taylor,” before “H Taylor being conspicuous by his fine defensive play in stopping the rushes of his opponents.” And finally “George got possession and passed to Bagwell, who in turn transferred to H Taylor, and another outburst of enthusiasm announced that that player had scored a try.” Gloucester won by one goal and one try to one dropped goal, and “as H Taylor left the field he was seized by some of the more excited and carried shoulder high up Brunswick Road.” These were to be Harry’s last tries for the Club. Harry did not play in the trial or the first County game of the 1887-88 season, but was selected for his third England trial, playing alongside his Gloucester teammate, J H Oakley, for Western Counties against London at Richmond on 9th November 1887. London won by one try to nil, and Harry’s hopes of an international cap were finally extinguished. However, he was recalled to the Gloucestershire side against Devon at the Spa on 11th February 1888. Although Gloucestershire scored three tries against a goal and a try for Devon, they lost the match because Devon had registered the only goal. At the Club AGM in the summer of 1888, the Club captain, Tom Graves Smith “tendered his warmest thanks to Mr H Taylor for acting as captain in his absence, and whose judgement had always been valuable to him.” Tom went on to say that “he was certainly sorry to hear that Mr Taylor intended to retire from football (“No, no” was the cry). If he did, he would leave behind him the most brilliant name on the record of the Club for good, honest, sound and fearless play, and his name would live as long as the Club existed.” Mr T H Chance responded by saying: “if H E Taylor should retire, he would do so with the greatest honour to himself, for he had not only distinguished himself as a player, but added much lustre to the fame of the Club”. 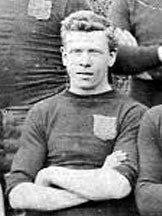 In fact, Harry was persuaded out of retirement to play a further four games in 1888-89, and made his final appearance against Cardiff on 23rd February 1889. Harry’s career for Gloucester finished with 108 appearances and 52 tries. He also made a final appearance for Gloucestershire against Oxford University at West Kensington on 27th February 1889: Oxford won by one goal and two tries to nil. Harry’s career with Gloucestershire ended with 14 caps and six tries. And he had three England trials to his name. Harry then moved away from Gloucester, and by 1891 was lodging in Tottenham, Middlesex, and employed as the foreman of a water works. In 1897 he married Catharine Brown, they had two children, and by 1901 he had moved his family back to Leominster, Harry died in 1947, aged 90, in Hereford.